It's no wonder that "The Flintstones" started out as a cartoon; a world in which human beings live in the stone age and use dinosaurs as household appliances is one incapable of surviving a live action production. Many people have enough difficulty in finding it plausible simply by description; it revolves around a town called Bedrock, where families live in houses made of stone, use chisels to write letters, drive cars using their feet as pedals, wear animal skins, and talk with the intellect and tone of an average modern family. Certain details are not that hard to believe, but the combination of them, among others, only makes this concept more pretentious and bloated. In the series, which embodies all of these qualities without a twinge of stability, the least ridiculous element was the fact that the Flintstones eventually went on to meet the Jetsons. Someone should tell this to the folks at Universal Pictures, who have a naive impulse to believe that success can be achieved by taking such a story and turning it into a live action film, all while using the same perception as the cartoon. They had done it once before, a few years ago, using John Goodman, Rick Moranis and Rosie O'Donnel as the stars, but anyone who has survived sitting through that mess could easily defend my view. Someone should have learned from this example, but no such luck; Universal was apparently devoted to their adaptation, as a follow-up immediately went into works and was planned for a release in 2000. The result is this dreadful, unfunny and infantile travesty of a picture, without incentive, logic or common decency. It follows the footsteps of its predecessor, the original "Flintstones" film, on almost the same note: using the same childish approach and pretentious substance. But the first film, highlighted by an ensemble cast, is a masterpiece compared to this. The change in casting is the first clue of a downfall; take away The B-52s, Rick Moranis and Elizabeth Taylor, then replace them with The Stones, Stephen Baldwin and Joan Collins. 'Nuff said. 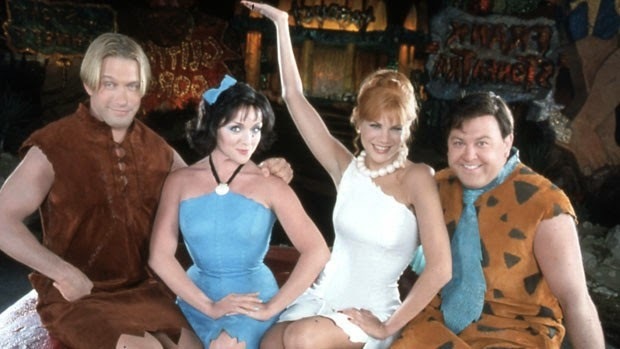 "The Flintstones In Viva Rock Vegas" (no points for an original title) is not a sequel, but a prequel to the commercially successful 1994 film, one which takes place before Betty became a Rubble and Wilma became a Flintstone. At the opening of the picture, best buds (and roommates) Fred and Barney are being tested for positions at the rock quarry, then given jobs after passing their exams. That night, both of them are at a nearby lake tossing rocks into the water when a small alien spacecraft plummets from the sky and crash-lands into a hill of sand. 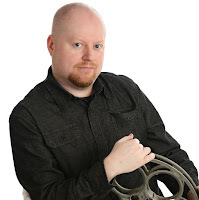 The alien inside--a midget-like entity named Gazoo--has arrived to study the human mating rituals, and chooses Barney and Fred as his experimental lab rats. This event triggers an urge in both Fred and Barney to quickly find dates. Meanwhile, the tired Wilma Slaghoople (Kristen Johnston) watches Bedrock from the balcony of her mother's secluded estate, where she avoids the advances of ex-boyfriend Chip Rockefeller and envies the simple life of those below (one of the movie's repeating details is that she wants to go bowling). Tired of living the high life, she goes down into town and befriends a kind waitress named Betty O'Shale, who thinks that the redhead is "cave-less" and offers to share her apartment. One night, both are at work at the drive-in restaurant Bronto King (get it? ), when Fred and Barney pull into a space and Betty comes to wait on them. They flirt with their waitress, who immediately notes their advances and offers a day of her and Wilma's company with these two men at the town carnival. The rest is history, to some extent. The "Viva Rock Vegas" joke in the title is only referenced once or twice by the picture's would-be villain after he realizes his competition. When we realize that Fred is devoted to Wilma, even though he's poor and she comes from a wealthy family, Chip Rockefeller, in pursuit of Wilma's family fortune because of his tremendous debt, invites the couples to the opening of his new casino in (you guessed it) Rock Vegas. It is there that the stability of these two couples' relationships are tested, and whether or not they were made for each other. The point of the film is not to find out where these couples are going (it should be obvious since the film is a prequel), but to discover how dinosaur fart jokes and cave men dressing up in drag can create so little amusement. The characters are one-sided and self-absorbed, and their jokes lack a punch of ambition (there is one wasted occurrence when a man in the casino shouts out that he is slowly poisoning dinosaur water supply so that the species will go extinct, and the others simply laugh at him). If the first film was like a misfire, than "The Flintstones In Viva Rock Vegas" is like seeing someone shoot an unloaded gun. The scary thing is that some people actually laughed at these jokes; the scarier thing is that none of them were children. The poor, unfortunate youngsters who witnessed the film during my screening were staring off into space like lost cattle, obviously uncomfortable, as if they were waiting for the end credits to start rolling (one amusing child excused himself to the bathroom three or four times, and 15 minutes at a time). Children like going to movies, no doubt, even if the films themselves are nothing to shout about. Here is the first in a long time that even manages to dishearten the small core audience it aims for.